As you have recently saw I went to NY for Fashion Bloggers Conference that were being held. I had a day to myself to sight see and just explore what NYC has to offer. My hotel was just a couple of steps from Canal Street. Canal Street is the mecca for all you "knockoff accessories". If you want it, it is there on Canal Street vendor after vendor with whatever you heart's desire. 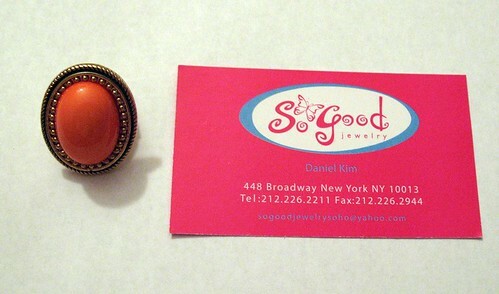 I some how made my into Soho and came across every woman's dream accessories depot, So Good Jewelry. Once I entered the store my feet left the floor (like in Willy Wonka Movie) and I went mad. I picked up everything I saw and wanted within my reach. As I would look at the price tags I was even more in shock because the prices are what every "Frugal Fashionista" hopes to one day encounter. The quality of the jewelry was impeccable. Mostly everything that I picked up was $4.99. Let's just say I spent a Benjamin Franklin without batting a eyelash and was completely satisfied. And that is very rare for me that mostly buys an item for $10 or below. You have to be/become a FAN of Fashion Without Guilt on our FACEBOOK or TWITTER to be eligible for the contest. And that is it. Just that simple. The contest end March 17th. 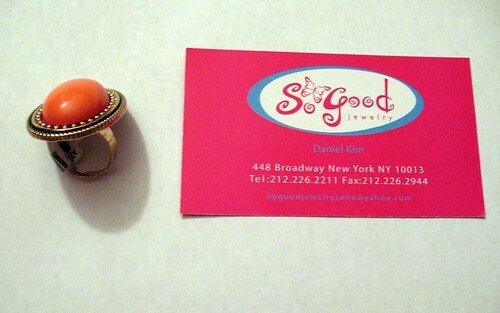 So please if you would like to win this ring from So Good Jewelry from NYC, please enter. i can probably spend all day in that store and go broke, lol. thanks for the giveaway! i re-tweeted it. OMG. I have to go to this store next time I'm in NYC. Thanks for the info, girl! I'd like to enter to win the ring. Following you on twitter and facebook.